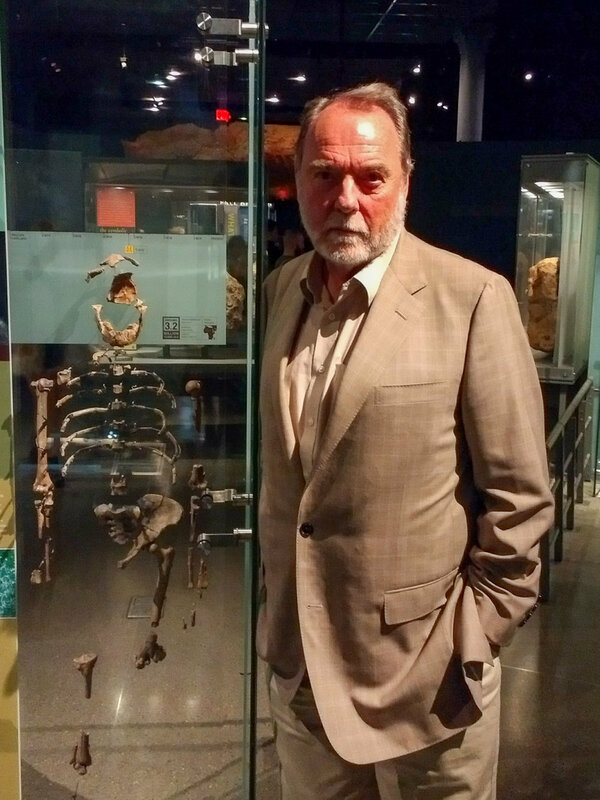 Ian Tattersall, Curator Emeritus of Human Origins, Division of Anthropology, American Museum of Natural History. Natural history museums are art galleries. Scientifically focussed art galleries, but art galleries nonetheless. Ian Tattersall, of the American Museum of Natural History in New York City, is a paleontologist who sometimes oversees the construction of models for the museum. 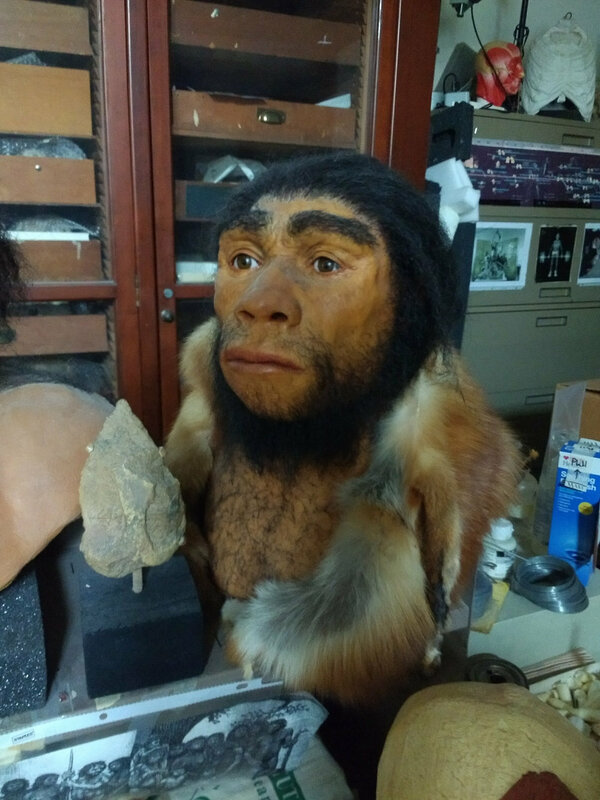 Of personal interest to Here Be Monsters producer Jeff Emtman are reconstructions of very lifelike early humans, one with an arm draped over the other. 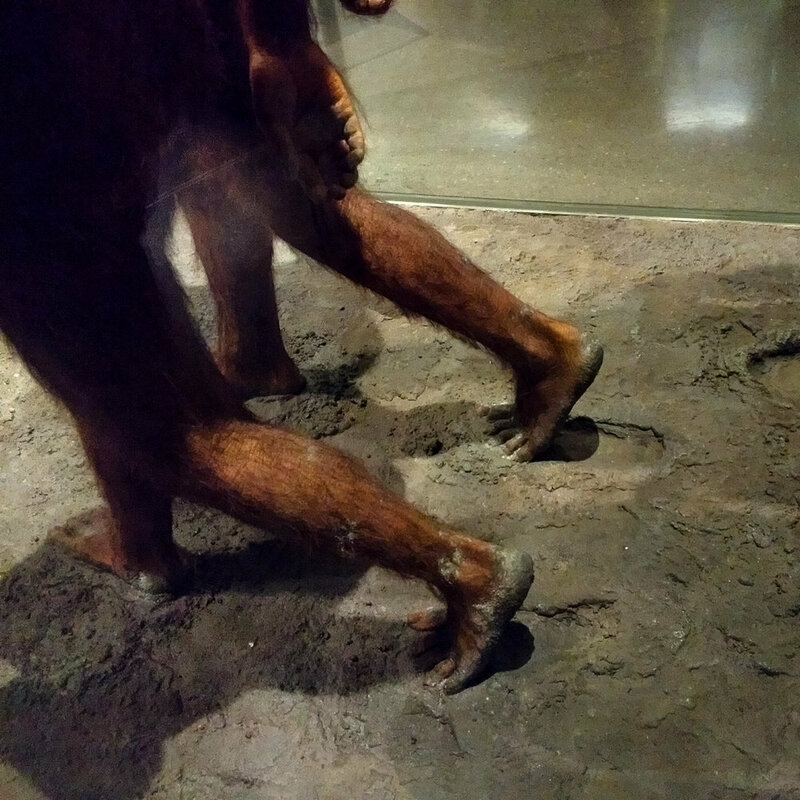 Ian calls these the “Laetoli Figures”—named for the place in modern-day Tanzania where some remarkable footprints of two hominids were found preserved in volcanic ash. 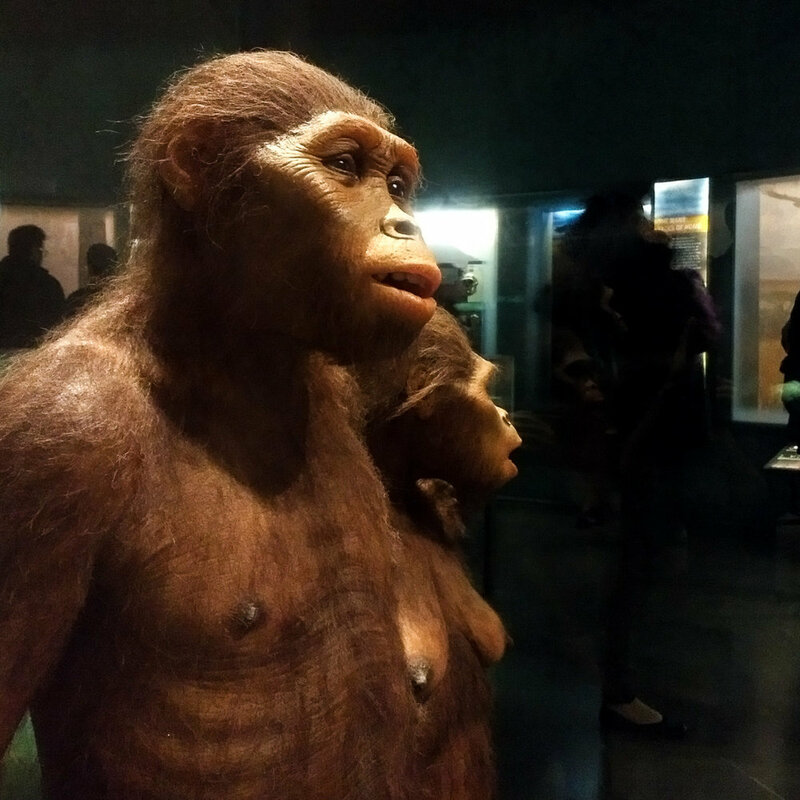 As far as early humans go, Australopithecus Afarensis are well understood. There are 300+ individuals in the fossil record, including the famous ~40% complete fossil of “Lucy”. Given the evidence, there’s a lot scientists can be pretty certain in declaring: they lived in the trees, but they could walk upright. They had small brains and big jaws, but their canine teeth looked a lot like a modern human’s. There are other questions that are answerable through inference, through studies of modern animals and other fossils. These techniques can yield a strong degree of certainty. Notice that a fossilized eyeball was not found. So how would anyone know that the sclera was white, which would cause it to look more human. [sic] The reconstruction is pure speculation about how Lucy’s eye looked. 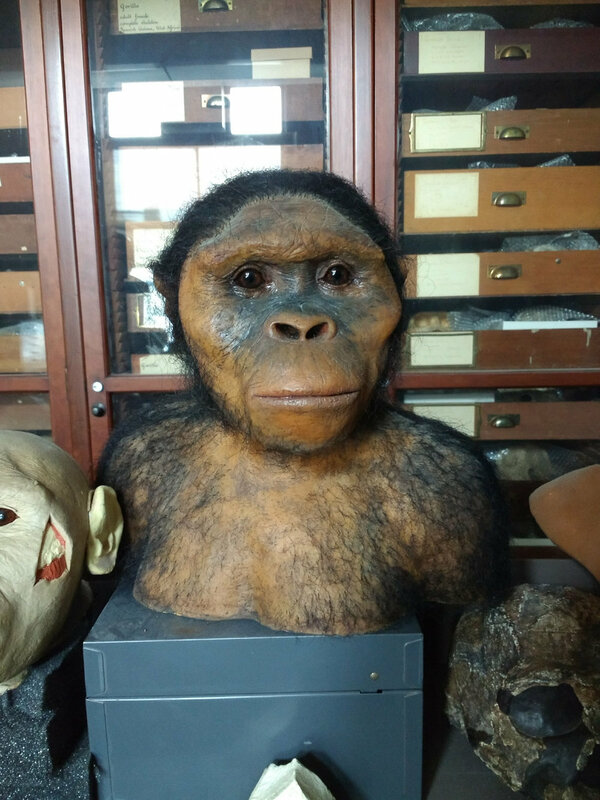 A replica of the specimen of Australopithecus Afarensis colloquially named “Lucy”. 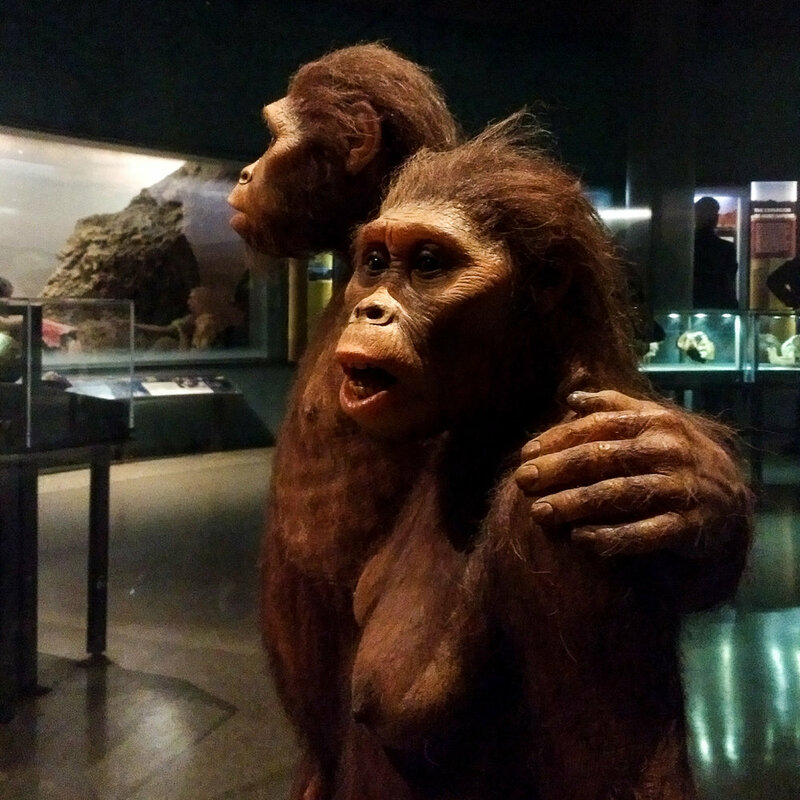 Natural history museums are faced with a decision: create full-flesh reconstructions that by necessity contain elements of artistic license, or, present the public with mere bones. Most seem to opt for the former, and understandably so. 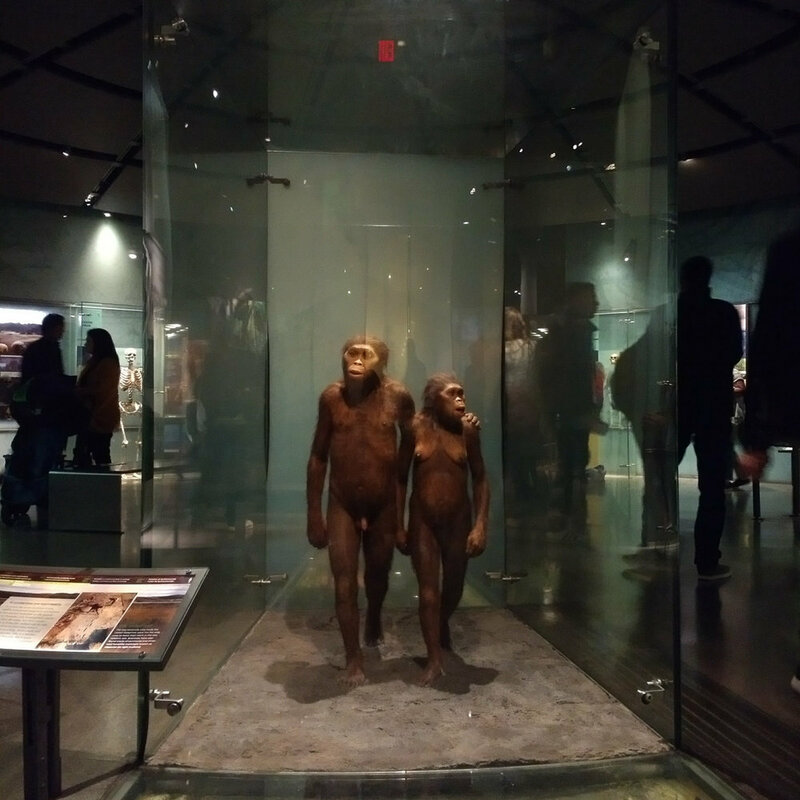 The museum serves the public, and, like HBM producer Jeff Emtman, they want to see something relatable and remarkable, a piece of scientifically-oriented art. And this question the artist must face, the question of the dark sclera (more ape-like eyes) and the light sclera (more human-like eyes) reveals something interesting about the artist and the process used to create the art. The choices an artist makes can speak to their worldview, their biases, and their knowledge per their location in the world and the current moment in time. You could not do a reliable reconstruction of an ancient human being or a dinosaur, or an extinct mammal without the science; and you certainly couldn’t do it without the art. And this is where the two really intersect in a meaningful way. 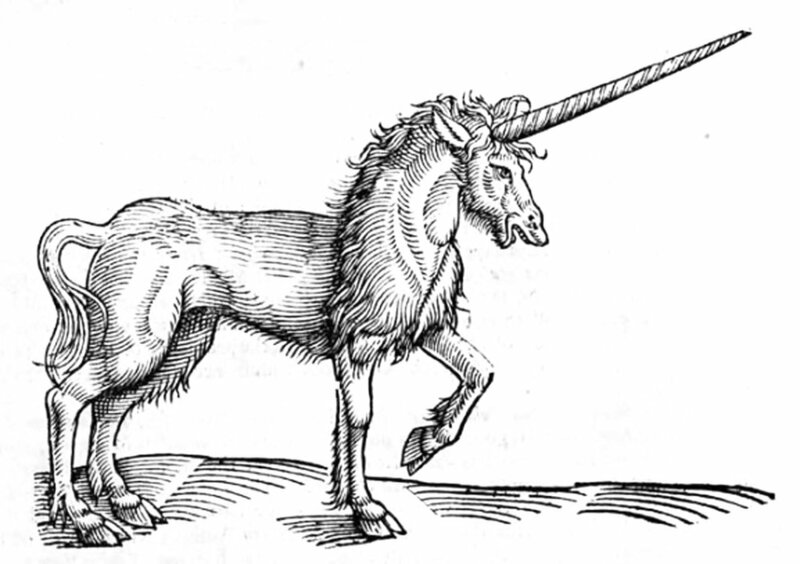 And the AMNH itself houses exhibits related to the ways in which modern assumptions about the past have affected the way the past is present, such as: Griffins in the Gobi Desert (protoceratops), Cyclops of the Mediterranean (dwarf elephants), and the infamous unicorn horns of Western Europe (narwhal). Jeff Emtman produced this episode. Voicemails from HBM listeners including Daniel Greene, Rachel Schapiro and Tony Baker. We want your questions for an upcoming mailbag episode. Maybe you’ve got a question about how we make the show. Maybe you have a question for someone we’ve talked to on an episode. Maybe you want some relationship advice. Maybe you can’t fix your damn microwave and you just need someone to tell you what to do. Give us a call: (765) 374 - 5263 or send us a voice memo: HBMpodcast@gmail.com. Also, check out our new meat poster, designed by Adam Fein, of HBM circle shirt fame. Get your HBM meat poster today!